Surprisingly, I had never used a Bluetooth headset with my phone before, even with all the tech I have/use daily. I've used Bluetooth before, just not for a headset attached to my phone. Before using, I fully charged the unit, about two hours. Just plug one end of the micro USB connector into the headset, the other into the wall/car charger. After charging, I synced up my phone to the headset, so I could hear phone audio over the headset, and brought the unit out to my vehicle. The most interesting part of the unit is how you "install" it in the vehicle. The dock clips onto your vehicle's vent. I did disable the vent so it didn't overly heat up or cool down. But the headset rests comfortably in the dock when not in use. Need to answer the phone, just pick it up from the dock, or tap it if not docked. The audio quality of the unit is fantastic. When chatting with my wife over the unit, she didn't even realize I was on a headset. The Bluetooth 4.0 standard it supports provides a higher bandwidth than the earlier standard thus offering clear audio. The active noise cancellation it provides means your speech is clear, too, with little to no background noise. Things I like about the unit. The biggest (littlest?) thing here is actually its weight. It weighs in at an amazingly low 0.3 ounces. You get about 5 hours of talk time, and you can take the unit around 30 feet away from the base before it loses the connection. Really my favorite thing is the weight though. Things i don't like... It only comes with a micro USB charging cable. It doesn't come with anything to actually plug that into. I have plenty to plug the USB side of the cable into, like the phone charger already in my car, but it would have been nice for the device to come with something. You can pickup a 2 port USB car lighter adapter for under $3 over at Amazon. Mpow could probably add one for their cost of maybe a quarter, but that would add to the size of the box, meaning less units per case. So I can see why they don't, but still would have been nice to have. Also, I paired my unit to a Samsung Galaxy 3. If you pair the unit with an iPhone, you can supposedly see the headset's battery level. This feature isn't available on the Android side. Bummer. Technically, you can use the device for listening to music from your phone. For me, I have better (Bluetooth) speakers/headsets for that. If you don't mind listening to music from only one ear, though, you can use the Mpow headset for that. At five hours of "talk" time, though, the Mpow headset will outlast many of your typical sport headsets at that price point. Not its primary purpose though. 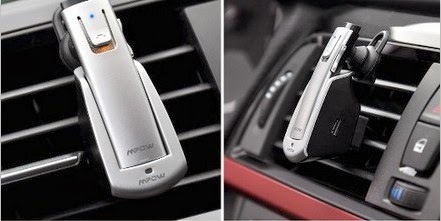 Overall, the Mpow Wireless Bluetooth Headset is a great, lightweight headset for making and receiving phone calls. Call clarity is great and battery life will satisfy most users. Its ease of use is hard to beat, too. All I have to do is get used to wearing this thing in my ear, even if it is comfortable and lightweight. This sounds awesome. Thank you for your review.